Coconut Protein Bites: No-Bake, Vegan, Nut-Free, Ready in Minutes! These little no-bake coconut protein bites were the result of last minute food prep. The weekend flew by and all of a sudden Sunday evening arrived. I needed something quick and easy to grab for snacks for the next few days. 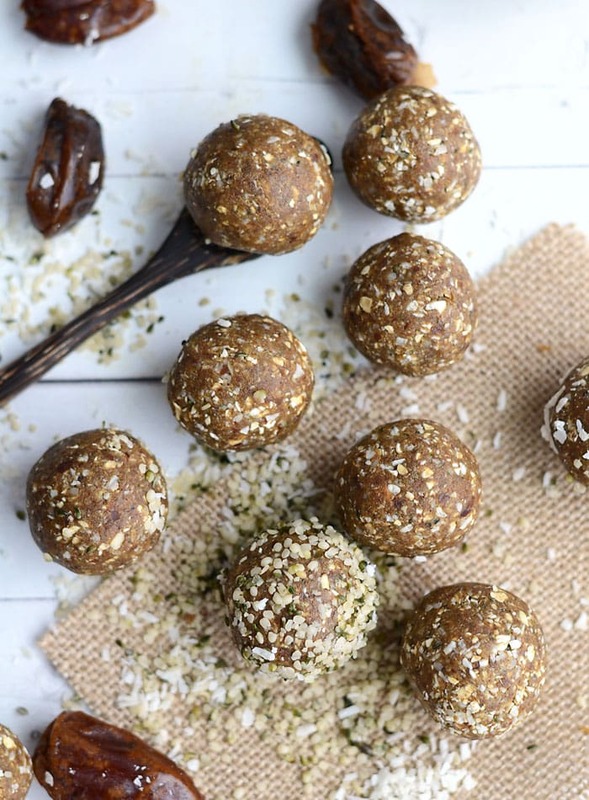 As a result, no-bake coconut protein bites were born! 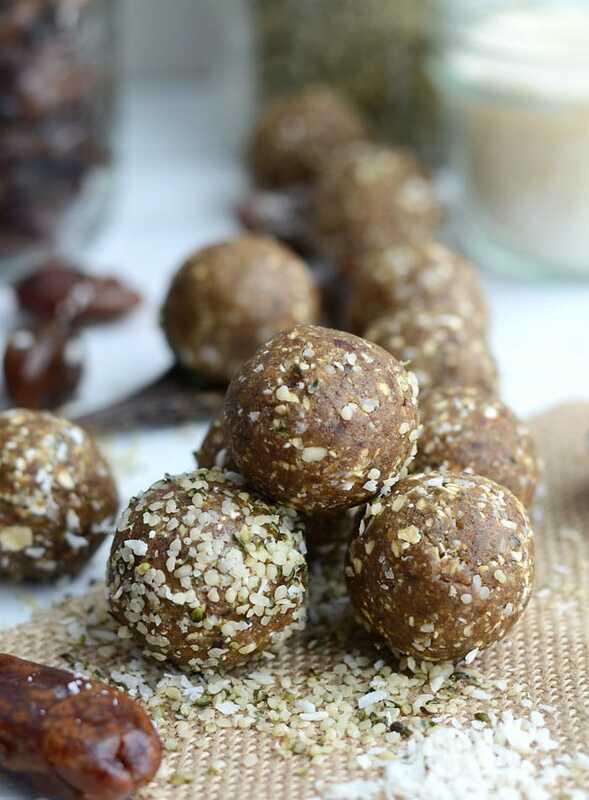 These delicicious energy bites balls vegan, gluten-free, nut-free and make a great snack, dessert, pre-workout energizer or grab-n-go breakfast! I love no-bake bite recipes. They’re so quick to make and are easily customizable. If you keep a well-stocked pantry, you’ll always be just a few minutes away from yummy and healthy snacks! 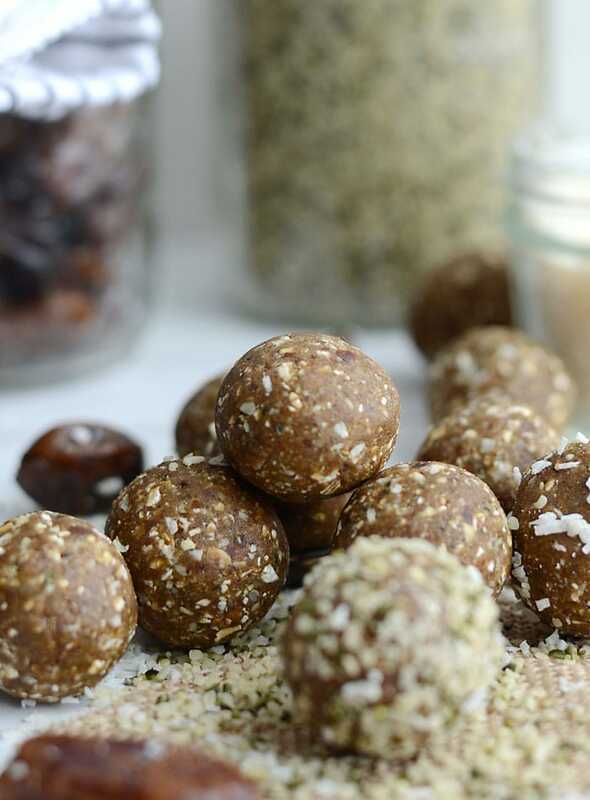 Here are my favourite ingredients for making no-bake snack balls at home. cocoa powder or raw cacao – perfect for brownie bites and all your chocolate creations! My favourite basic no-bake bite recipe is 1 cup of medjool dates blended with 1 cup of nuts. I usually use almonds or cashews but pecans, walnuts and hazelnuts area all delicious! You can also use oats or shredded coconut. From there, try adding cocoa powder to make them brownie bites or almond or peanut butter for more flavour and decadence. I often just start with a base of medjool dates and keep adding ingredients until I reach a flavour and consistency that I’m happy with. Feel free to experiment and see what you can come up with! I use my Ninja blender for making all my bite recipes. For the price point, I think it offers great value and I use it to make everything from no-bake energy balls to nut butters, soups, smoothies, hummus and more! I’m often asked what can you eat before and after workouts if you eat a vegan diet and I’d have to say, simple, whole foods are the best choice. 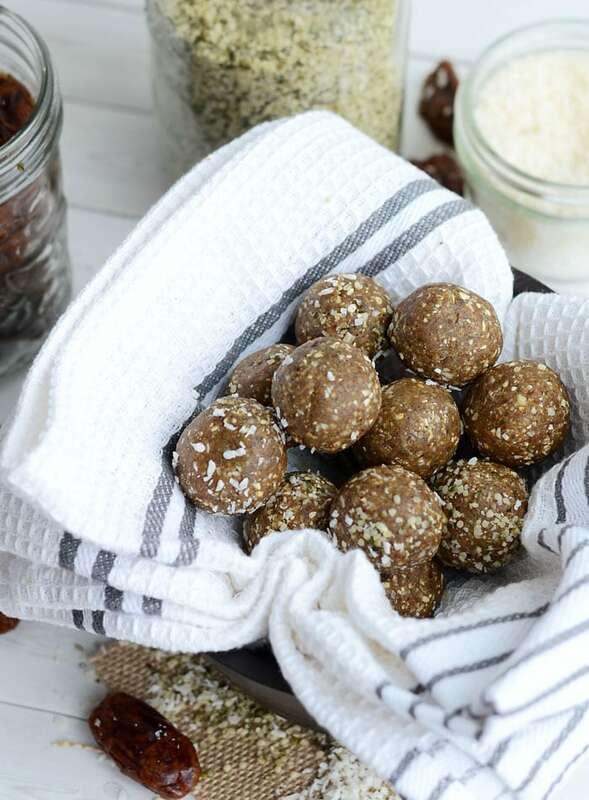 These no-bake coconut protein bites make a great snack for both before and after workouts. These have a good balance of fats, carbs and protein in them making them a suitable choice to fuel up pre-workout or recover post-workout! I’d recommend a serving size of 2 for a yummy plant-based energy boost whenever you need it! Skip the vending machine, keep a few of these on hand and you’ll not only enjoy a sweet treat but a natural boost in energy from these healthy ingredients. 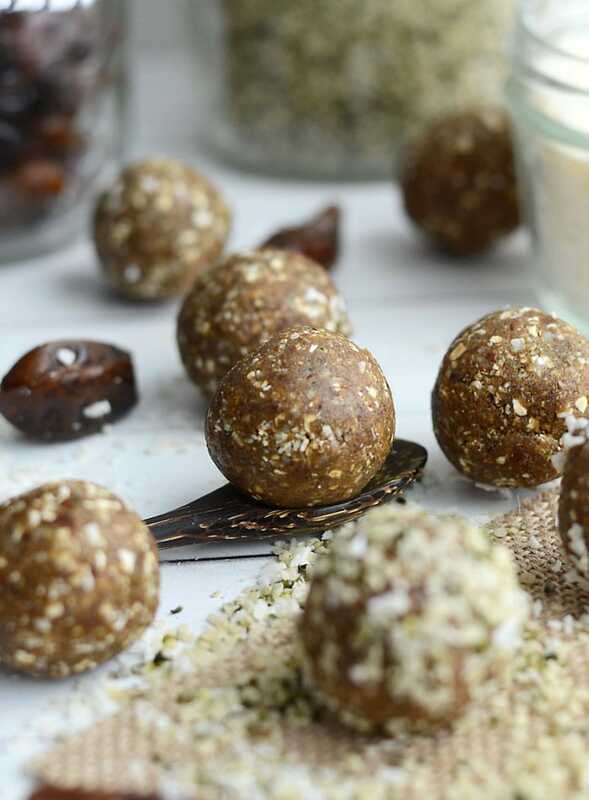 These no-bake coconut protein bites only take a few minutes to make and are packed with plant-based nutrition and flavour! Gluten-free, nut-free, kid-friendly and delicious! If your dates aren’t soft, soak in hot water for 10 minutes and drain before using. For best results, use fresh, soft medjool dates. These look divine and gorgeous pictures too! I’m a loyal Asics girl! I guess I’m a loyal Asics girl too, although I’ve been known to be swayed by sales 😉 Nothing like a new pair of runners for motivation though! When it comes to running shoes, I’m a skechers girl as I have as flat as flat can be feet so most other shoes make my feet ache. Jesse is a Nike devotee but he hasn’t managed to convert me (we both have super flat feet – our kids will probably have inverted feet ;P). As for socks, Jesse is a big spender when it comes to socks whilst I go for cheap socks as I’m constantly losing them and it drives me crazy! I lose them all the time too and in fact, it would be rare to find me wearing matching socks. Haha. But I just bought a few good pairs so hopefully I can keep them together this time! brown rice protein? what do you use & where do you get it? 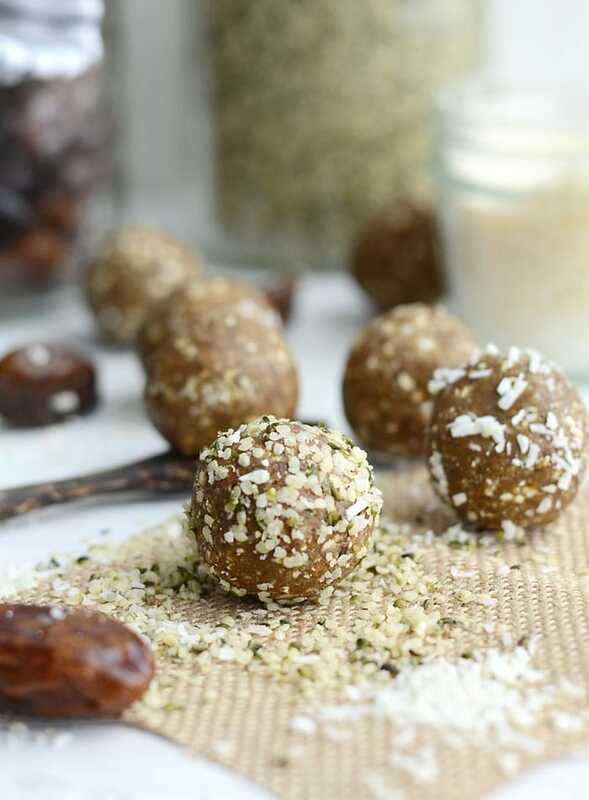 I love dates and coconut- now add some hemp or maybe chia( and all the other great things in this recipe) make for a great snack. These would be great food on the run and 1000 times better than any gel pack or packaged bar. Add about 3 tsp sea salt for the extra electrolytes and it is complete for replacement. 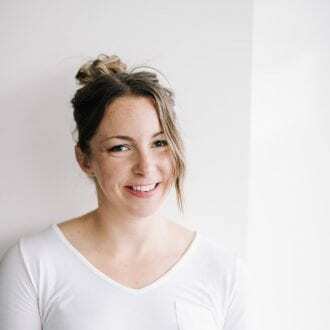 Write about running, food, garden and fitness. What would you suggest using if you can’t eat dates? I haven’t tried this recipe with anything else but you could try soaked prunes, dried cherries, figs or raisins. You may need to soak them before using so they’re moist enough to hold the recipe together though. Good luck!